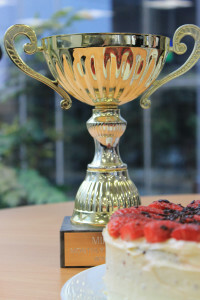 At Mirus HQ we’re very happy that today is a Bake-Off day! Newsbies Chris and Laura went head to head, and even newer newbies Josh and Chris (another Chris) had the onerous task of judging. The poor cherubs – we do make them work hard in their first week. Stepping up to the gauntlet, Laura presented her Fancy Summer Gateaux to the judges with modesty and hesitation. Chris, certain to lose-out to Laura’s Gateaux, charmed the judges insisting he choose the ‘optimal dryness’ for his Chocolate Marble Loaf - his entertaining presentation scoring him a few cheeky bonus points. The judges clearly ended up with a tough decision on their hands, after ranking both cakes on concept, presentation, taste, and delivery very highly, but it was Chris’ Chocolate Marble Loaf that nabbed the win by half a point! Chris also makes a few enemies as he moves to the top of the leader board, with disgruntled colleagues Kate, John and Chris (another another Chris) now plotting to re-instate themselves as Cake Champ. Everyone’s a winner as both cakes were delightful!